A company with many branch offices will inevitably face the difficulties in communication. Pinnacle Technology (ACLAS brand), a high-tech enterprise, headquarters in Taipei and sets two factories in Xiamen. As the company scales up in size, the communication and cooperation between headquarter and branch offices become increasingly costly and inconvenient with the traditional telephony system. By installing the Yeastar S100 IP PBX and S300 IP PBX respectively in the Taiwan headquarter and Xiamen branch offices with peer to peer networking, all ACLAS employees from different sites can be synchronized with efficient communication and the company also benefits from high productivity. Pinnacle Technology Corporation is a Taiwanese manufacturer established back in 1982, with headquarter in Taipei and two factories including R&D center (about 110 engineers) located in mainland China. 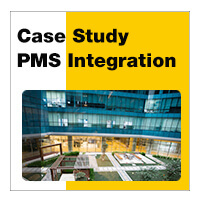 Pinnacle develops, manufactures, and sells innovative commercial devices under ACLAS brand, which have been registered in 50 and 32 countries respectively. As a high-tech enterprise, Pinnacle keeps enlarging its scale with increasing number of employees to meet its needs in developing, manufacturing and selling. It inevitably brings some difficulties to the enterprise management, especially in the communication and cooperation. The phone calls between Taiwan headquarter and Xiamen branch offices should be dialed with the phone code, which is cumbersome and costly. ACLAS’ factories are large with lots of departments, which makes it hard to target the specific person to receive the call, leading to the inefficient information conveying. Every plant has its independent loud speaker. However, it is not feasible to broadcast unitedly to the entire factory. Two traditional PBXs were installed because of the expansion of the department. But the department extensions connected to different PBXs cannot dial each other directly. The existing automated attendant setting is outdated with few lines, which largely affects the customer call completing rate. Three sets of telephony system cannot be managed in a unified way, which is likely to lead to the disorder of the lines, extensions and the inbound and outbound rules. Yeastar put forwards an IP PBX solution for ACLAS after fully understanding its needs and situation. 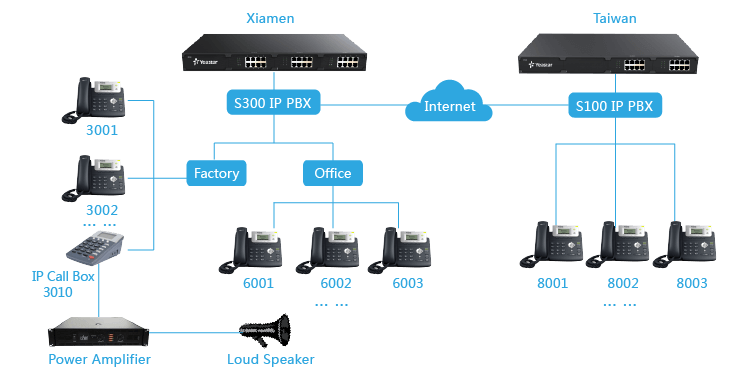 Install the S100 IP PBX and S300 IP PBX respectively in the Taiwan headquarter and Xiamen branch offices and connect the two IP PBXs with peer to peer networking through the Internet. Replace traditional phones with the IP Phones and register them to the respective Yeastar IP PBX through the local area network. Install the IP Call Box in the plants that have loud speakers by registering the IP Call Box as one of the Yeastar IP PBX extension and connect it to the Power Amplifier. After connecting ACLAS offices with Yeastar IP PBX, the voice will be transferred through the network, realizing the free call between extensions of both sides. The extensions of both sides can use each other’s external lines to call the local phone number of the other side, turning a overseas call into a local call. It largely reduces the call expense. Phone broadcasting: users can use IP Phone to dial the extension number of the IP Call Box to broadcast unitedly or regionally through the Power Amplifier. 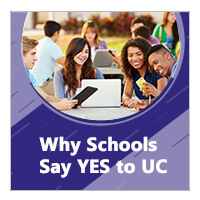 In addition, users can also use it to broadcast to the IP Phones, mobile phones and computers. Even the Taiwan headquarter can broadcast to the Xiamen branch offices with the phone broadcasting. Broadcasting response: When the department manager is making the inspection tour of the plants, the company leader can use the phone broadcasting to find the department manager. This manager can also use the handy IP Phone to stop the broadcast by pressing the “ * ” button and change broadcasting into the peer to peer calls with the company leader. Linkus: Install the Linkus Mobile Client in the users Android or iOS mobile phone, the users’ mobile phone will become an office extension and links them and their colleagues and customers anywhere anytime through the WIFI or mobile network. Conference call: users can dial the conference number with his office extension or mobile phone to attend the conference anywhere and anytime. S-Series IP PBX also provides a visual control panel to help the conference organizer to manage the conference. What’s more, Yeastar S-Series IP PBX is also embedded with SIP Forking, call recording and other advanced features to improve the working efficiency of the enterprise. Call Recording: Yeastar S-Series VoIP PBX can be set up to automatically detect every phone conversation made on users phone. Users can record all inbound and outbound calls free without charge. It also provides retrieving function with visual multi-pattern conditions for easy management of recording files. Modular Design: Yeastar S-Series VoIP PBX provides flexible telephony interfaces combination while allowing for future scalability with unique modular design. Besides the built-in rich SIP capabilities, S-Series lets users decide what types of extensions and physical trunks they need in their telephone system. Easy Configuration: Control and update your phone system with intuitive and graphical UI and point-and-click configuration using S-Series online Configuration Panel. Everything can be managed easily from any Internet-enabled device.